My very first wearable project. Still exploring this subject I decided to make a dress that could glow up, depending on a certain kind of input. To do this EL wire seemed to be a perfect fit to make a dress glow since it is very flexible and quite easy to sew on a dress. The certain kind of input should be sound and I have really no idea how to accomplish this. So, programming EL wire is very badly documented and especially the Sparkfun EL sequencer which I’m using. 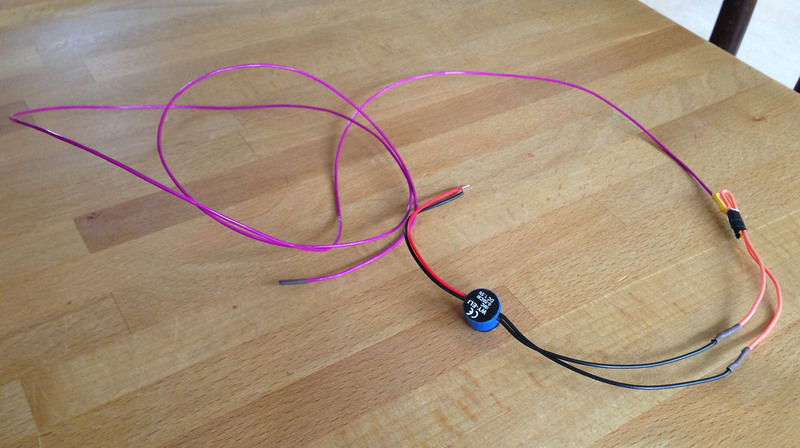 Soldering EL wire is very well documented and this was quite easy to do, I tried it out with a very thin piece of EL wire I got from TU/e together with a tiny and very cute inverter. Use this with a 1.5V battery. It’s not safe to do this with a 9V battery, the inverter generates a very high current so DON’T do this. This EL wire however was not as bright as I expected it to be, maybe because it is very thin? For my dress I ordered Sparkfun’s EL wire and this is thicker and much brighter, I love this stuff and together with the EL sequencer I think it’s possible to do some pretty neat tricks. Be sure to buy the right inverter, it depends on the length of EL wire you would like to power. I bought 9 meters of wire so I got the 12V inverter since the 3V wouldn’t produce enough power to light it all up. This is the first time I turned my dress on, it worked and I was thrilled. I am currently sewing more EL wire on this dress and planning a nice shoot to get some nice photo’s I can show here!